The challenge facing the United States is building a 21st century navy, operating in 19th century-styled great power competition, and upholding a 20th century world order while urrently led by an administration which seems to challenge the foundation of that very order. When we look at the current emerging world order, the last comparable historical period was pre-World War II, and perhaps more accurately pre-World War I. This takes the form of a world order of competing great powers, now on a global, not Eurocentric, scale. Great nations are working out the balances of power and arguing about and testing international rules. Same as it was in the 19th and early 20th century, maritime strategy and capabilities will play a central role in the emerging multipolar world order. In another way, the 19th century is a useful frame of reference. The way that the Trump administration, and particularly the president, has talked about military force in some ways resembles the thinking of 19th century great powers. So how does the strategic thinking of the U.S. Department of the Navy compare to the thinking of the current administration? Currently, we are seeing a new world order being structured, following two decades of American hegemony since the end of the Cold War. Leading regional powers are demanding more prominent roles and influence in world affairs, to match national self-perception, economic performance, and military capabilities. States like China, India, Russia (and an organization like the European Union also has the potential to act as a great power) are becoming regional powers in their own right, and particularly China and Russia are challenging the United States. In many respects, the situation that we are witnessing is very similar to the world order which dominated the 19th century and early years of the 20th century. Currently the United States is first among equals, same as Great Britain was the dominant maritime power as well as the economic force in the 19th century. This was until the United States and Germany caught up and eventually overtook the British Empire economically. In the maritime domain British dominance ended in 1922 with the Washington Naval Treaty, when Great Britain formally accepted naval parity with the United States. Today the dominant military and economic power is the United States with states like China and India increasing their capabilities in those areas, while Russia does not present an economic competitor, but presents a military challenger both in Europe, the Middle East, and Arctic. Same as it was in the 19th century, the maritime domain is essential to the world order today. Commercially 90 percent of world trade is transported by sea, and militarily there is a growing development of navies – especially in the Indo-Pacific region. China is building a blue-water navy to project power on a more global scale and protect commercial interests and its sea lines of communication (SLOC). India is entering the same process in relation to its “Look East Policy,” and Russia shares similar ambitions. At the regional and tactical level, however, modern advances in military capability influence this 19th century-like competition – challenges that the United States is compelled to counter in order to maintain its dominant global role. This goes both for its role as a politically leading state and militarily, but also in order to secure open Sea Lines of Communication (SLOCs). This challenge is the increasing access to Anti-Access/Area Denial (A2/AD) capabilities across a greater number of actors. These A2/AD capabilities increase the risk both to U.S. military capabilities in case of conflict as well as to the free movement of commercial shipping traffic even before direct military operations commence. This challenge confronts the United States in the Indo-Pacific (most prominently seen countered with continued Freedom of Navigation Operations in the South China Sea), but also in other areas of the world. NATO faces A2/AD challenges from Russia in both the Baltic region, and also in the Black Sea and Arctic regions. Challenges also exist in the Middle East in ensuring the safe transportation of goods across the world’s oceans given Iran’s own A2/AD capabilities. The increased presence of A2/AD capabilities is an essential part of the military dimension of competition that we are witnessing today, as they are part of the efforts of both China, Russia, and Iran to manifest themselves as regional hegemons that can dominate and control access to their respective regions. Such a situation would threaten the unrivaled (until now) maritime dominance of the United States. Since the inauguration of President Trump, his administration has emphasized the centrality of “Peace Through Strength” in its foreign policy and the need for expansion of U.S. “hard power” capabilities. 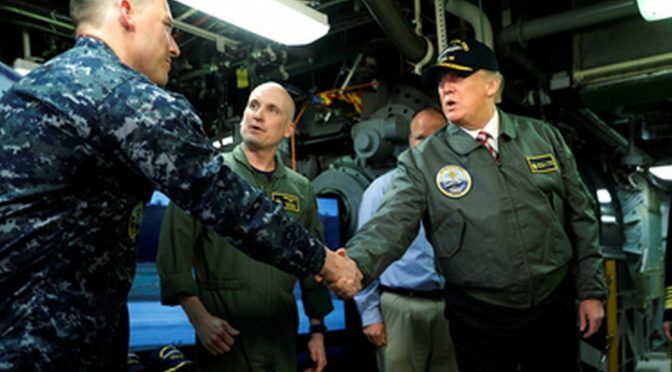 Maritime capabilities are part of these hard power capabilities, as then-candidate Donald Trump promised an expansion of the U.S. Navy to 350 ships from its current 283 ships at a campaign rally in Philadelphia in September 2016. The concept of “Peace Through Strength” was later made a central tenet of the administration’s first National Security Strategy. This was already the case with the first budget proposal submitted by the administration, which was presented by Budget Director Mick Mulvaney as “a hard power budget” focusing on increasing U.S. defense budgets. This military expansion has Teddy Roosevelt-like undertones, as military might is continually emphasized by especially President Trump in his diplomatic dealings with countries like North Korea or Iran. The U.S. military is once again an obvious “big stick” – same as it was for Theodore Roosevelt in the early 20th century. To President Roosevelt an expansion of the U.S. Navy was central to let the United States take its place among the great powers of that era, and this was the signal that he wished to send, when the “Great White Fleet” was sent around the world: The United States now had a great power fleet able to project power across the globe. The Navy was central to making the United States an international actor, who for example could mediate in the Russo-Japanese War, and become an influential power on the world stage, alongside great powers like Great Britain and France. For President Trump the ability to project power across the globe is also central to his understanding of the United States as a great power – one that other nations best not cross. An example of his way of discussing military force was in the summer of 2017 when the President announced that the United States had sent “an armada” towards the Korean Peninsula in order to deter North Korea from further nuclear tests. This was an old fashioned “gunboat diplomacy” statement, from a time when great powers used their navies to project power and deter smaller actors (and peer competitors) from further provocations. This same kind of “gunboat diplomacy” could be seen in the two instances, when missiles were fired against the Assad-regime following the use of chemical weapons against civilians. Here U.S. vessels (along with allied vessels) were sent to the region to conduct the strikes. Another example of the president’s more classical understanding of military power in diplomatic relations is the issue of a military parade in Washington D.C. This follows the classical understanding of displaying military forces to remind other actors of one’s great power status. The foundation of the Trump administration’s foreign policy is the concept of “America First.” This has so far meant a distancing from central pillars of the liberal world order that previous U.S. administrations had built and supported since the end of World War Two. For the first time in decades, a U.S. administration has strongly spoken out against free trade agreements, multilateral organizations, and questioned U.S. alliances in Europe and Asia. The reasoning is based on a perception of U.S. interests being thwarted in multilateral organizations, where the superiority of the United States cannot be as readily utilized to dictate outcomes more favorable to itself. In the understanding of the Trump administration, the superiority of the United States is still so great that it can challenge allies and partners to change behavior or deal with an American withdrawal from partnerships. U.S. allies are welcome to cooperate with the United States, but it requires a greater acceptance of U.S. interests. Similarities to the 19th century can thus also be found in this less multilaterally-focused foreign policy – which instead is based on an understanding of the superiority of U.S. hard power and the associated dependence of allies. So just as the current world has similarities to the world order of the 19th century, so too does the way that the U.S. president talks about military power – and deploys it. If we look at U.S. maritime strategy and statements by Navy department officials the clear trend is that the department is preparing and modernizing for a multi-polar world order and, in line with the National Security Strategy, for great power competition with actors like China and Russia. This systemic and multilateral approach can also be seen in the 2015 follow-up to “A Cooperative Strategy for 21st Century Seapower”: “Forward naval presence is essential to strengthening alliances and partnerships, providing the secure environment necessary for an open economic system based on the free flow of goods, protecting U.S. natural resources, promoting stability, deterring conflict, and responding to aggression.” The focus of maritime strategy has for more than a decade been on the systemic foundation of American power and on how to cooperate with allies and partners to fulfill this role. However, the plan for the Navy department also includes expanding its number of ships – both in line with department policy and the president’s promises during the 2016 campaign. The purpose of this enlarged fleet was in April 2018 defined by the Secretary of the Navy, Richard Spencer, at a public hearing at the Senate Armed Services Committee as: “the building of a more lethal, resilient, and agile force to deter and defeat aggression by peer competitors and other adversaries in all domains and across the conflict spectrum.” To fulfill the strategic needs of the United States, it is judged that the U.S. Navy will need 355 vessels. The process to reach that number will take decades according to the Navy department’s own 30-Year Shipbuilding Plan. According to this, the aim of 355 ships may not be reached until the 2050s. The strategy and plans of the Navy department are for a focus on securing the liberal world order that has underpinned U.S. hegemony for, while acknowledging that the U.S. does not have the necessary capabilities to do this alone, and therefore needs to cooperate with allies and partners – while further capabilities are being built in a multi-decade process. There is no doubt that the international order is changing in these years. The hegemonic status of the United States that arose following the collapse of the Soviet Union is being challenged. There are more similarities to the 19th century great power competitions, than to the Cold War era of bipolar competition. For this reason, more traditional aspects of great power competition is reemerging such as the focus on balance of power and the building of capabilities to offset challengers. Given the extent of global trade travelling on the world’s oceans, the maritime domain of course plays a central role in this strategic environment. With the election of Donald Trump, the United States has gotten a president with a more realist view of great power relations, emphasizing hard power in his diplomacy with regional actors like Iran or North Korea. The hard power diplomacy is based on talking more openly about U.S. capabilities, as well as displaying military forces in a classical “gun boat diplomacy” fashion. This has been a clear method for President Trump since the campaign. However, this also results in a discrepancy between the rhetoric of the administration, and the strategy of the Navy department. Here, the strategy is based on a long-term build-up of forces supplemented by plentiful cooperation with allies and partners – also through multilateral organizations and upholding international norms and rules of the liberal world order. The process to reach this strategy took more than a decade following the fall of the Soviet Union, only now to be met by an administration challenging the very order that this strategy sees as the very foundation of U.S. global power. Another discrepancy is the current administration’s understanding of the current capabilities of the U.S. military. The administration handles its hard power diplomacy as though the build-up that is underway was in fact complete. But by pursuing key changes in policy toward North Korea and Iran, and adding volatility that increases the risk of military conflict, the administration is exposing the military to overstretch because currently the Navy conclusion is that it does not have the capabilities to fulfill even its current commitments let alone a major contingency. North Korea and Iran are also regional actors and not the great power competitors that are the alleged focus of the newly issued National Defense and National Security strategy documents, and thus sap attention and resources away from identified priorities. Whether the Trump administration’s foreign policy results in a more withdrawn U.S. role in global affairs, it is inevitable that the maritime domain will still be central to U.S. interests. Commercial interests and security concerns will demand a strong American naval presence – whether it is to support an offshore balancing strategy, continued active presence, or a more isolationist strategy. All three will require unified strategic clarity both from the administration and the Pentagon – a clarity that does not seem to exist. Philip Chr. Ulrich has an M.A. in American Studies from the University of Southern Denmark. He is foreign policy editor at the Danish news media Kongressen.com and has contributed to and written several books on U.S. politics and history. Most recently he has written a biography about General David Petraeus, that was published at the University Press of Southern Denmark. Previously, he has worked as head of section at the Royal Danish Defence College, where he published several briefs on U.S. defense and foreign policy. This article spends the first 95% in laying out the obvious (history). The conclusion in the last sentence is completely devoid of analysis, insight, and understanding of how the government of the United States works. Not unexpected from someone from an ancillary NATO member. The current administration is simply leveling the playing field economically in the aftermath of three successive administrations giving away concessions (and cash) to friends and foes alike is the “hope” of world peace – or something. Renegotiating bad agreements into fair ones just means that the United States is going to stop paying all of the bills for the rest of the world – including NATO and the EU. The challenge for the United States in fleshing out it’s stated Naval capacity is purely money. 21st century weapons systems are extremely expensive – and ships are at the top of that expense list. The recouped savings through renegotiated agreements can then be invested into the sustained modernization of the U.S. Navy – which is a global benefit – even to Denmark. This author grants far too much credit to Trump’s “understanding” of anything except building condos and screwing his partners repeatedly. He is simply applying his unethucal and destructive business practices to government. He is clueless about how anything works in the real world. His riduculous, but planned, hyperventilation over NK nukes, conducted as a pretext to his ridiculous “summit” with Kim, itself a pretext to Trump declaring that he’s “denuclearized North Korea” … Which of course he did no such thing. Trump is all stage managed theater, with not a stitch of thoughtful strategy involved other than a strategy to feed his enourmous ego. Trump will soon be vacating the oval office, most likely in January 2021. His successor will most likely be the anti-Trump, given that the American electorate has established a pattern since 1992 of fully repudiating each successive occupant of the oval office by electing whoever is perceived to be the incumbent’s polar opposite. Perhaps some day our electoral process will become more norm-seeking rather than polar seeking, but given Trump’s intensive radicalization and upsetting of longstanding bipartisan policy, it seems unlikely that the next POTUS will be anything other than the Anti-Trump. In the meantime, the US Navy will keep chugging along as a somewhat moderating influence over the wildly gyrating spasms in the oval office.